The Candia Food Pantry is open to ALL CANDIA RESIDENTS. It is located in the basement of the Candia Town Offices. Please note: If the Town Offices are closed, the Food Pantry will be closed as well. To use the Candia Food Pantry, visit the town hall during food pantry operating hours. Ring the white buzzer, just inside the first door of the town hall. A food pantry volunteer will come and assist you. Please bring proof of residency, such as a driver’s license or photo id. One member per household is welcome to visit and receive groceries when food pantry is open. The Candia Food Pantry is stocked by donations. If you bring a list of items you need or want, we will try our best to fill your order. 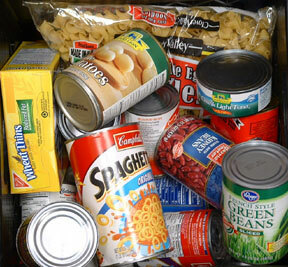 The Candia Food Pantry is stocked by donation only. We cannot guarantee that these items will be available on a regular basis. Beauty Products: Shampoos,conditioner, toothpaste, etc. Paper Products: Tissues, toilet paper. Condiments: Ketchup, mustard, relish, etc. Baking Ingredients: Flour, sugar,condensed milk, etc. Canned soups: Chicken noodle, beef stew, etc. Beans: Garbanzo, pinto, kidney, etc.